Clayton Thorson stood in the backfield awaiting a snap. 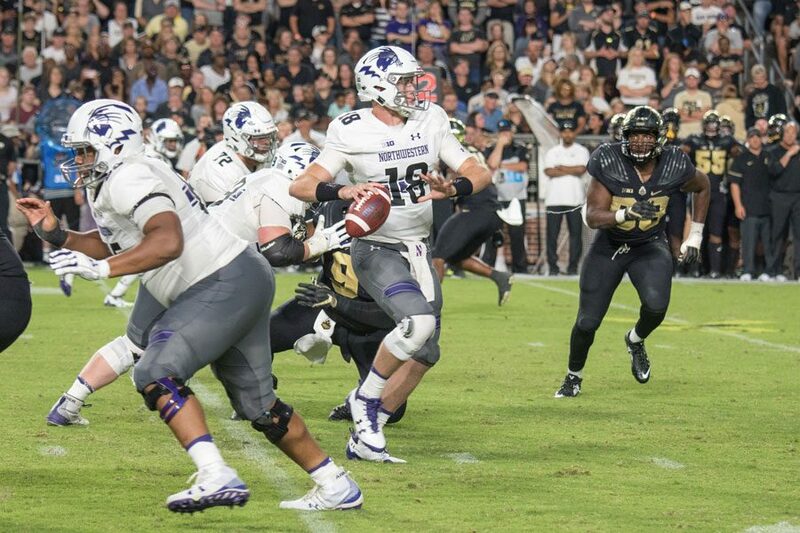 It was his 40th straight game as Northwestern’s starting quarterback. But it was only the second game in his career in which there was any doubt that he would be there. Only nine months earlier, he had torn his ACL catching a pass on a trick play in the Music City Bowl. Coach Pat Fitzgerald had been coy throughout the offseason as to who would start. But on Aug. 30, there was No. 18, four yards behind center Jared Thomas about to start his fourth consecutive season leading the Wildcats. On the third play, Thorson dropped back and completed his first pass of the 2018 season for seven yards to junior superback Cam Green. From there, it was business as usual. A short run and two more completed passes had NU deep into the red zone. Three plays later, sophomore running back Jeremy Larkin was plowing into the end zone and the Wildcats’ offense was back. Thorson, of course, did not play the entire game. He was replaced intermittently, starting with NU’s third drive, by junior T.J. Green. He didn’t lead every drive until NU’s fourth game. But that opening drive put everyone on notice: Clayton Thorson was back, ACL tear eight months ago be damned. Thorson has stayed in the background. He has put up gaudy numbers. He has awoken to make massive plays. Never, however, has he so directly doomed the Cats as on Sept. 15. 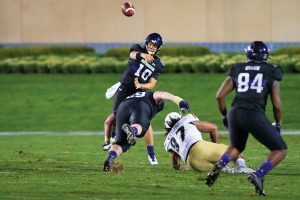 On that night against Akron at Ryan Field, Thorson turned into the Zips’ best scoring option. He threw two pick-sixes in the second half, one of which was returned 97 yards, and sandwiched them with a fumble that also ended in an Akron score. The end result: Akron 39, Northwestern 34. The loss dropped NU to 1-2. It marked a second consecutive home defeat to an unremarkable team after an uninspiring setback to Duke a week earlier. The stretch had echoes of 2016, when the Cats started 0-2 with back-to-back home, nonconference losses. For a half against the Zips, NU showed no signs of trouble. The Cats went ahead 21-3 at the break, failing to dominate a lowly foe looking for its first win against a Big Ten team in 124 years but doing enough to lead comfortably. Then the collapse began: The visitors, true to their name, zipped down the field with ease, as if NU’s defense was subdued by the late-summer air. Thorson gave away the lead with his fumble. He then allowed Akron to extend its lead to two scores with his second pick-six, 64 seconds later. The Cats never recovered in that game. But from it, NU may have recovered the season. Thorson led his team onto the field in what seemed like a dire situation: two minutes left, no timeout, down seven points, 99 and a half yards from the Nebraska end zone. But former Cats running back Justin Jackson, preparing for a game against the Cleveland Browns, was confident. On the first play of the drive, the Cornhuskers committed a roughing the passer penalty. Flynn Nagel made a key third down catch, then Thorson connected with him for 32 yards to take NU into Nebraska territory. A Ben Skowronek grab brought the Cats to the Cornhuskers 5-yard line, and then Thorson found JJ Jefferson — the fourth different receiver of the drive — to even the score with 12 seconds to go. 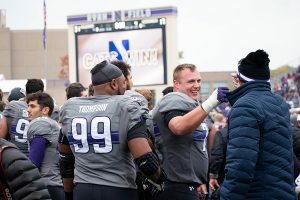 Just minutes later, walk-on kicker Drew Luckenbaugh won the game for NU in overtime and the hosts avoided a potentially disastrous loss. The Cats would win their next five Big Ten games, but none as dramatically. Thorson had a career-high 64 attempts for 455 yards, and Nagel had a career-high 220 yards. Heading into week nine, NU was in flux. The team that had built a 17-point lead on then-No. 14 Michigan and defeated the country’s best rushing defense on the road at then-No. 20 Michigan State was somehow the same one that needed overtime to beat then-winless Nebraska and came dangerously close to losing to lowly Rutgers before pulling out a win. Then Wisconsin came to Evanston. The Badgers, then ranked No. 20, brought one of the nation’s best rushing offenses, led by running back Jonathan Taylor, who leads the country in total rushing yards. The Cats rose to the occasion, claiming a 31-17 win over the Badgers on Oct. 27 for the first and only game they’ve won by more than 10 this season. 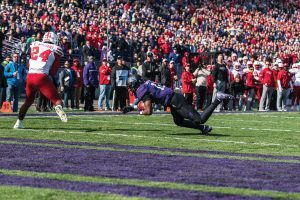 NU’s defense held Taylor to a season-low 46 yards and the Badgers to a season-low 165 total rushing yards, and additionally recovered three Badger fumbles that each set up scoring drives for the Cats. The game also proved that freshman running back Isaiah Bowser, who shined in a 113-yard performance against the Scarlet Knights, was far from a one-week wonder. Bowser ran for 118 yards on a whopping 34 attempts and a touchdown against the Badgers; in each of NU’s four games since, he’s rushed for more than 80 yards. After the upset win over Wisconsin, the rest of the country began to take notice of what was brewing in Evanston: on Oct. 28, NU received its first AP Poll votes since week two. In the five weeks since, the Cats have moved up as high as No. 20 in the AP and No. 19 in the College Football Playoff Rankings. Skowronek didn’t know Thorson’s sequence of reads, Thorson just about overthrew Skowronek anyway, Fitzgerald couldn’t see anything that was happening, and the end result was the touchdown that sent NU to the Big Ten Championship. In this most strange of seasons, one in which the Cats lost all three nonconference games and decided all 12 regular-season contests by two scores or fewer and somehow won their first-ever Big Ten West title, perhaps it was fitting that Skowronek’s game-winning touchdown at Iowa was equally unlikely. In the box score, it went down as a 32-yard touchdown pass to put NU ahead of the Hawkeyes 14-10 with 9:27 remaining. In reality, it was a prayer of a go route ending in a spread-eagle miracle catch in the back corner of the end zone, and it also turned out Skowronek wasn’t even expecting the ball, incorrectly thinking he wasn’t the primary target on the given play call. The Cats’ defense held the Hawkeyes from ever threatening to retake the lead, and the night ended with a purple mosh pit at midfield of a frigid and once-packed Kinnick Stadium, celebrating the news that Purdue and Wisconsin’s losses and NU’s win had sealed the division title with two weeks left to go. 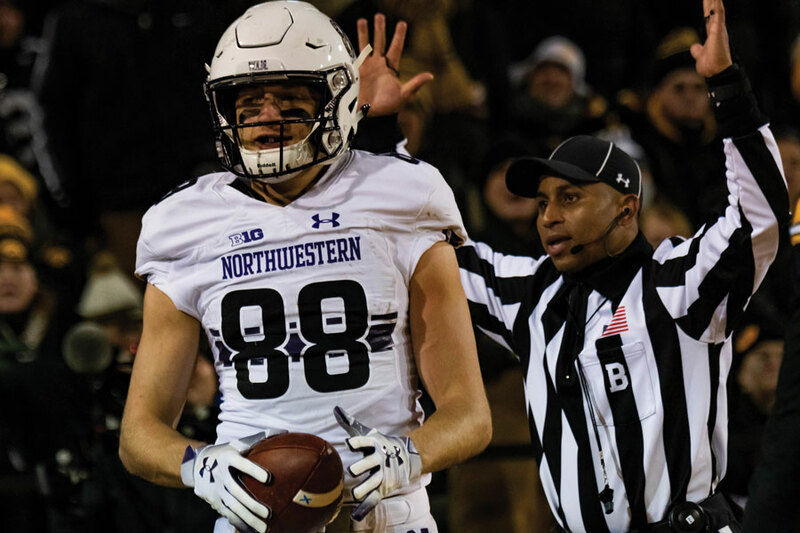 For Skowronek, the team’s second-leading receiver this season with 40 catches for 514 yards, the play proved to be the ultimate validation of his career.